Don’t miss the upcoming Trend Demonstration Days at Mackays on Saturday 25th July and Saturday 8th August . 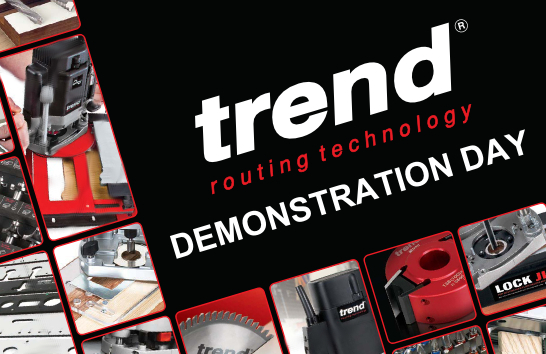 Join us for great Trend Routing product demonstrations and fantastic on the day deals. Watch the experts demonstrate the amazing new Scribemaster Pro , as well as many other brilliant routing and woodworking products. During our Trend Demonstration Days we will be offering a FREE cutter and knife sharpening service from the Trend diamond sharpening expert Diamond Dan. Using the Trend Diamond Cross sharpening range Diamond Dan will give your knives and cutters a new lease of life. As well as the FREE cutter and knife sharpening service on offer there will be some fantastic on the day special deals. For more information about our Trend Demonstration Days follow our Twitter and Facebook feeds or Call 01223 517000.